Today's post is all about gloss! As most of you know, i don't normally post about glosses that much as they aren't always my go to products but here is a post for all regarding these fantastic glosses. Catrice is available from local pharmacies around Malta. I picked these up whilst I attended a bloggers event held a couple months back. Ultimate shine and volume: your lips are sure to become absolute eye-catchers this fall! The Lip Appeal Lipgloss has a subtle vanilla scent, a moisturizing formula and comes with a special applicator for an even more gentle, smooth application. Available in four new trendy colors with find shimmer particles. 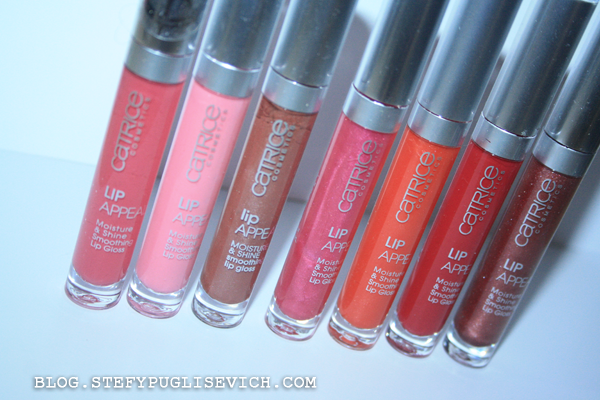 After trying these out, some are pretty pigmented where others are very sheer and not true to colour. Some have that sticky texture yet i love the scent of the vanilla in the tubes. I would personally use these glosses after applying a lipstick to finish off a look. There are alot of different colours to choose from light pale glosses to dark intense lip colors such as reds and berries. Ooo, I love Coralist and Little red dress! Thanks for sharing :) You have a lovely blog!